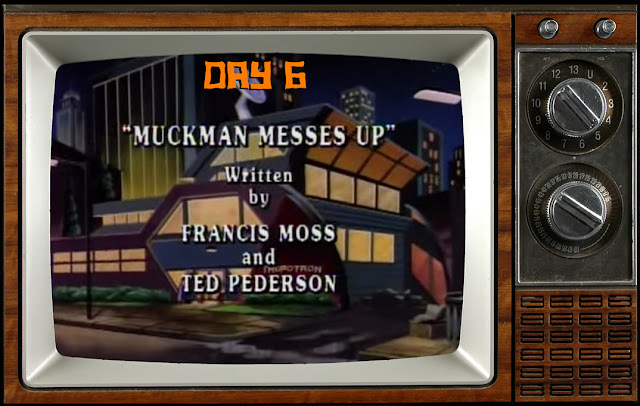 Let's get dirty on Day 6 with Muckman Messes Up from Season 5! 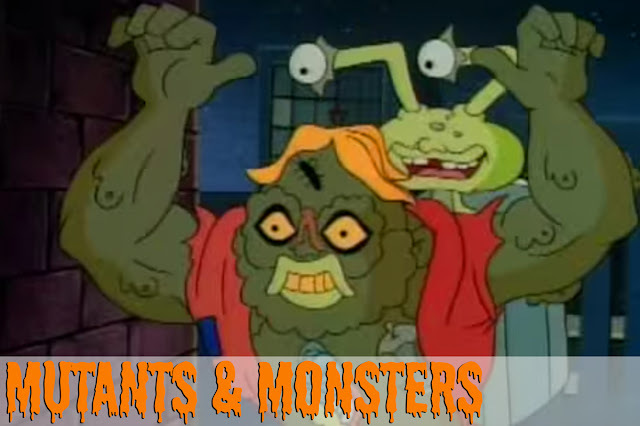 Goo, garbage, and grotesque mutants! 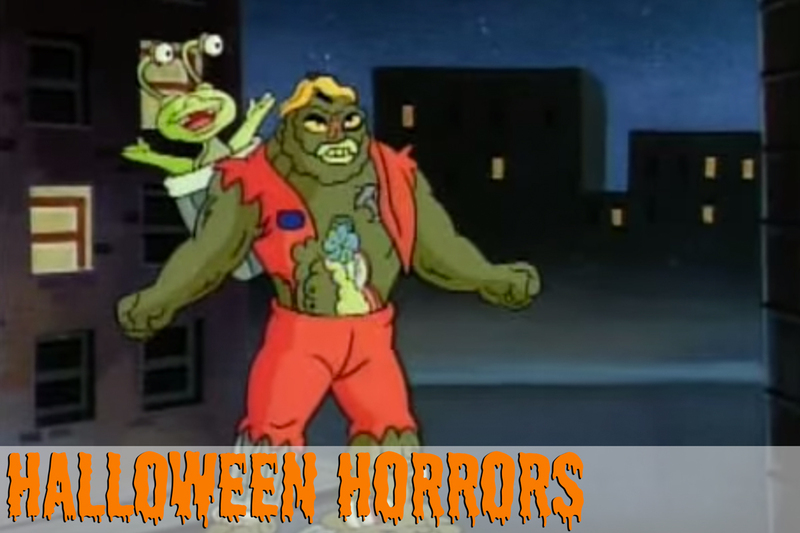 An accident causes two sanitation workers to mutate into filthy freaks, who happily call themselves Muckman & Joe Eyeball. They soon learn their transformed bodies produce a slimy substance that weakens the Turtles, bringing them to their knees. Shredder takes advantage, tricking the dirty duo into joining his side. 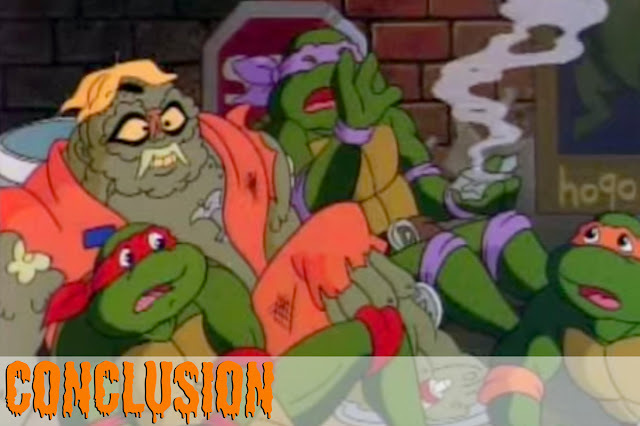 Can the Turtles take out this trash or will they be left to rot in defeat? October is a month like no other. We flush away normalcy and become oddly attracted to revolting imagery and morbid scenarios. Halloween is a screwy celebration of all things freaky. And Muckman Messes Up marches in that misfit parade. Just look at these two glorious globs of filth! They're completely revolting, yet have inexplainable charm. No other mutants or monsters needed, Muckman & Joe Eyeball are the scary stars here. These dudes are incessantly entertaining. Their winning combination of frightening and funny deserves an award. Muckman is also a Toxic Avenger-inspired creation (another man with a lowly job that got transformed into a super-strong). But, he swapped his tutu for a bug-eyed, squirmy sidekick. The eerie episode takes place mostly at the night and features a lot of horror movie-like shots. There's a real dedication to the shot composition too. Every frame creates a sense of fear and raises the scary stakes. My favorite scene places Muckman & Joe Eyeball in a shadowy alley, trapping a panicked April & Irma. The guys are lurching forward with arms up - true masters of terror. A big question looms. Mystery burns inside you. 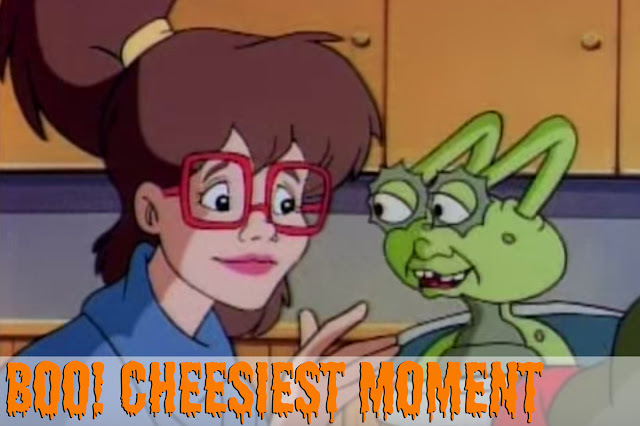 Can mutated garbage find true love? Muckman Messes Up serves up more than just scares, there's romance too! Throughout the episode, Joe Eyeball's scrappy little heart beats for the clumsy Irma. For a funky sidekick, the dude is smooth! He tosses around pickup lines and even gives Irma a gift (a wormy glump of gray trash). His persistence pays off and their chemistry clicks. She tells the tiny critter that she "likes his eyes." 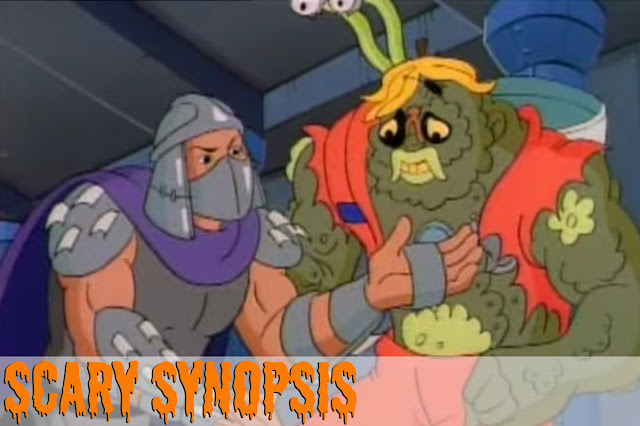 As the episode progresses, Muckman & Joe Eyeball shift their allegiances and embrace Turtle Power. Seeing mutant Turtles pal around with these 2 weirdos is a blast. It's like Trick or Treating with your best of friends, wearing the best costumes. Check back tomorrow for Day 7 of Horrors In A Halfshell!